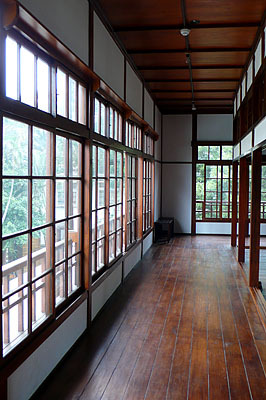 Originally built for the Japanese Patriotic Women's Association, this newly renovated building has been the home of a few different organizations over the years. For the last few years, this fantastic remainder of the Japanese era has sat behind iron fences and sheet metal while it went through an extensive restoration process. In the summer of 2011, however, this beautiful building was unwrapped and given back to the city. Situated directly across from the Confucius Temple and right next door to Lily Fruit Store, this building that once housed a woman’s association for the Japanese elite has been reopened as a small museum and exhibition space. The Japanese Patriotic Women’s Association began in Tokyo in 1901 and set up branches in Taipei, Taichung, and Tainan in 1904. The branches in Taiwan were mostly made up of the wives of Japanese dignitaries and social elites. These women sought to improve the social welfare of their communities, and enacted this in the form of fundraising, charities, health care, and other social services. They were part of the movement to abolish foot-binding and set up organizations that provided women with vocational education. They also provided photographic and film events for their communities. The current building that housed the Tainan branch of the association was completed in 1940 and has served many purposes since the end of World War II. 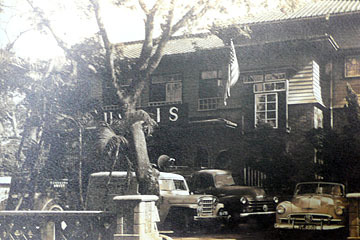 The KMT rented the building to the Information Services of the US Embassy (USIS) in 1948 and then donated the building unconditionally to the Red Cross in 1950. Despite having command of the building, the Red Cross allowed the US Information Services to remain in the building until 1979 when it then allowed the Central Branch of the Tainan Municipal Library to move in. It remained a library until 2001 when it was handed over to the Tainan Fine Arts Association for use as a study center and library. In 2008, it closed down for a three-year restoration project. This old photo of the building's days as the US Information Services building is on display inside. Open again, the building is a gorgeous wooden oasis in a concrete jungle. The restoration was a terrific success. It now functions as both a museum unto itself and a space for various exhibitions. Some of the rooms are set with period furnishings that allow you to experience the space as it might have been during the Japanese era. Even without the mock-ups, the wood and tile work, the windows, and the layout are all a reminder of the building’s Japanese origins. It is an architectural delight that makes you wish you could move in and make it your home. One room has been set aside with information about the history of the building and contains some nice old photos and an anecdotal story about the USIS days. The other rooms are available for rotating exhibitions, but a Chi Mei Museum exhibition on the second floor, dedicated to the founders of Tainan, may remain permanent. Hours: Still seems to be a little unsettled. Admission: Generally free, but some exhibitions may charge. You’re back! Great post, more please. I cherish the days of serving as a consultant to the director during 1964-67. It must have been a great building to work in.